Cupcakes 'n Daisies: On Deck . . . . . .
Wow, can you believe it's Friday, where did this week go......and we're already in our second week of April...somebody in this house better get going in her sewing room before the month's totally gone!! The Planters Nut Mobile! But there he was, big as life. For some reason, little things like this just make my day....but it gets better....see those guys on the right, with the yellow purses.....they were handing out free bags of nuts! What could possibly top that! Maybe planning ahead to my next project? You know me, when I get close to finishing up one quilt, I'm thinking ahead and plotting my strategy for the next one in line. The next one up is Wild Goose Chase by Deborah Borsos for Painted Pony 'n Quilts. This quilt can be made in two sizes, lap and twin. I'm going with the twin. This pattern is really just a clever way to set sampler blocks. I'm not using the 12 inch sampler blocks provided with the pattern. The last sampler quilt I made, Snowbird Migration, used Marti Michell templates for all its blocks. 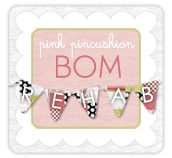 That was such a wonderful experience I'm hooked on those templates for life. So I've been studying Marti's books and so far have picked two blocks to substitute for a couple of blocks in the pattern. And what fabric am I choosing?? I'm going to untie Stars and Coxcombs by Barbra Brackman for Moda. I've been in love with this fabric since I bought it in January. I've been surprised how little I've seen of this fabric out in blogland, it's almost like it's a secret. I don't think I've seen a single top made using this fabric and it was hard to find an online shop that carried it. I intentionally started my Jacob's Ladder project in between State of Grace and Wild Goose Chase to give myself a little break on block and fabric making decisions. I think that was a good plan, I'm really looking forward to making those decisions for Wild Goose Chase, just need to finish Jake! Speaking of which, the border for my Jacob's Ladder has mitered corners. I'm excited about that too, I've been wanting to try mitering corners for a quilt for a long time, this is the first chance I've had to go with mitered corners, but I don't know how. Does anyone have a tried and true method they could pass along? THANKS!! Finally, I got some great ideas for using my poppy fabric. What I found most interesting were the comments from folks who had started this same pattern but hadn't finished it. For some reason that made me feel better about quitting after a dozen or so blocks. I liked the idea of pinwheels, so I'm going to search for a good pinwheel pattern. If I don't find something to suit I may just start making blocks and throwing them on my design wall. How's that for a plan? That's all I've got, I hope you have a safe and happy weekend! Might have to get some more of those marti mitchell templates! OMG I am crazy in love with Wild Goose Chase...I may just have to order that pattern...LOVE IT! I was thinking of the poppy quilt...could you make something of it for the veterans hospital near you? That would be a great fabric for that or a quilt of valour. I love the accuracy of Marti Mitchel templates but I did find it tedious, and perhaps slightly dangerous to a klutz like me. Though I didn't get the encyclopedias. Those must be fun to flip through. I've done mitered corners, not that difficult but more time consuming than regular borders. You just have to take your time, measure and sew carefully. The directions in Quilters Visual Guide are very good. There is probably a demo film on YouTube as well. Here's an idea for a pinwheel pattern:Peppermint Swirl, p. 226 in the Thimbleberries Book of Quilts by Lynette Jensen. It can be made bigger easily, but has a nice setting square to show off your fabric in between the pinwheels. How funny....we just got that Wild Goose Chase pattern in at the quilt shop last weekend and I set one aside. 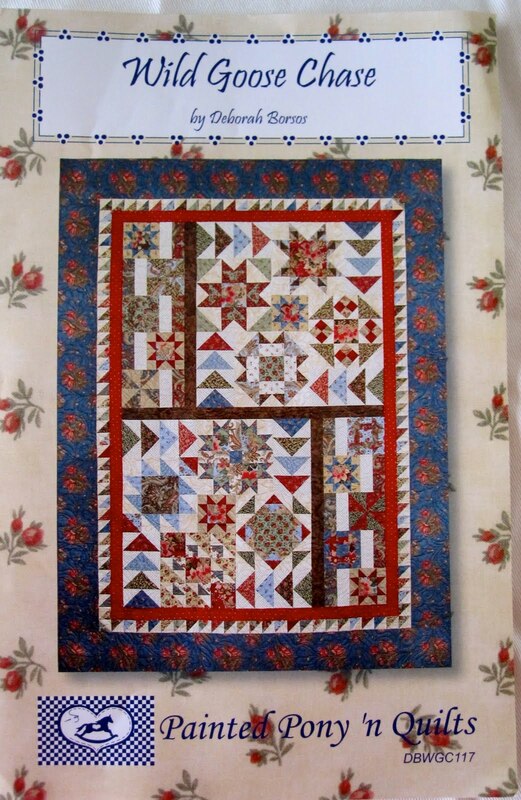 I love sampler quilts and this is such a cute one. Can't wait to see your Jake quilt. Mitered corners seem kind of intimidating, but they're not as difficult as they look. You'll have no problem. 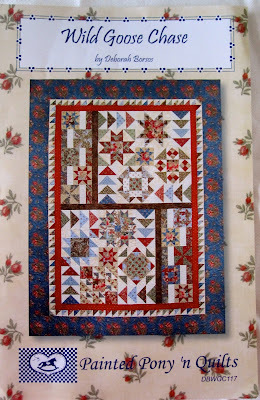 ps i quilt is hosting a pinwheel sampler on her blog - you might look at it to see if it would work. I'm sad that I won't be sewing along with you on Wild Goose Chase. I can't wait to make mine out of Martinique, but I have some obligation sewing to do first. But - hey - at least you get to find any mistakes with the pattern and warn me about them! I love the Wild Goose Chase quilt and can't wait to see yours progress. I have a Stars and Coxcombs charm pack but haven't done anything with it yet (or any other of my charm packs for that matter). It's so funny that before we are even close to finishing one project, we are thinking about starting several others!! I have never seen that fabric around here. This will be another winner! It is always more fun to start a project than to finish one. The Wild Goose Chase seems like a good choice for your next project. 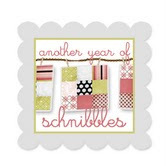 I just ordered some Marti Michell templates myself. i've looked at that fabric lottsa times and LIKED it ... but i didn't buy it ... i think it's the name of the line - what were they thinking when they named that bee-oo-tee-ful fabric Stars and COXCOMBS?!? seriously?! ?